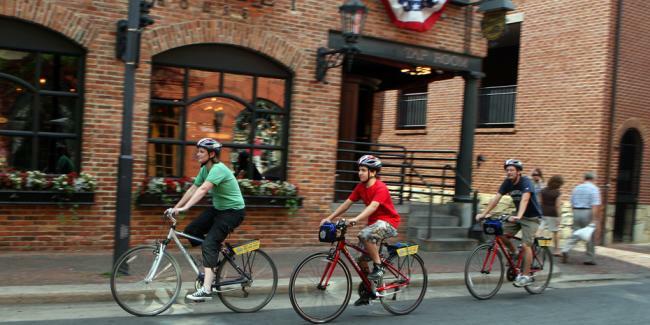 With its charming neighborhoods and winding trails, Alexandria, Virginia, is a biker’s dream. Bike lanes on major thoroughfares (Cameron, Prince and Pendleton streets) cater to cyclists, so you can easily go your own way with a bike map and rentals from Capital Bikeshare, Bike and Roll, Pedego Electric Bikes and Wheel and Nuts Bike Shop. Alexandria also marks the halfway point on the Mount Vernon Trail, the 18-mile path between Washington, D.C., and George Washington’s famed estate. Take in leafy landscapes as you wend your way along this waterfront route, stopping for stunning photo ops of riverside monuments. Mount Vernon by Bike and Boat. With this premier package, start in Alexandria and cycle to George Washington&apos;s Mount Vernon, where you can enjoy touring the historic estate, grounds and museum. In the afternoon, board the Potomac Riverboat Co.&apos;s Miss Christin for a narrated boat cruise back to Old Town. Bike to Mount Vernon. Pedal along the waterfront Mount Vernon Trail with a Bike and Roll bicycle rental to George Washington&apos;s Mount Vernon estate and tour the grounds before biking back to Old Town Alexandria. Bike to DC. Rent a bike through Capital Bikeshare, Bike and Roll, Pedego Electric Bikes or Wheel and Nuts Bike Shop and pedal along the waterfront Mount Vernon Trail to D.C. Visit the National Mall and monuments and museums before biking back to Old Town Alexandria. Mount Vernon Trail. This 18 mile walking/running/biking path takes you from Rosslyn (just across the bridge from Washington, DC) to George Washington&apos;s historic Mount Vernon. 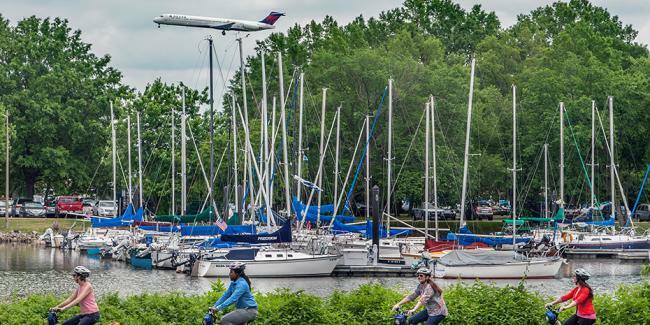 As you ride alongside the stunning Potomac River, you&apos;ll pass views of the national monuments, Arlington Cemetery, parks, Old Town Alexandria and George Washington&apos;s waterfront estate. Eisenhower Trail. The Eisenhower Avenue Trail extends 1.8 miles from Cameron Run Regional Park east towards the Eisenhower Metro Station. Area trails. 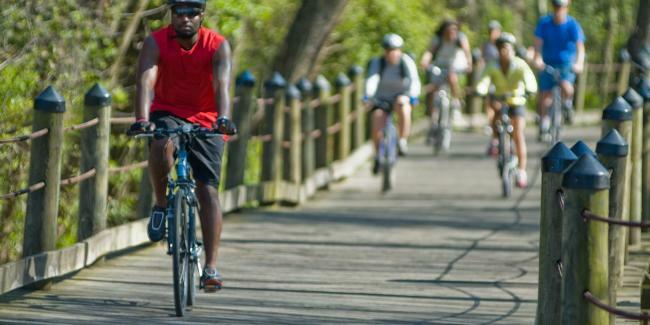 Check out other trails in the Washington, DC region. East Coast Greenway. This 3,000-mile urban bicycle and walking route connects hundreds of communities from Calais, Maine, to Key West, Florida. Alexandria marks the midpoint of the trail. With a Capital Bikeshare membership or day pass, pick up a bike from one of the many stations throughout Alexandria to get around the city and drop off bikes at any of the 400+ stations across the Washington, DC region. City bike map. To obtain a printed copy, stop by the Alexandria Visitor Center, City Hall, or any of our recreation centers. The map is free! Interactive bike map. "Ride the City" provides point-to-point bike directions, taking into consideration local routes and other access information. Regional bike map. Check out this comprehensive map to see a biking map of the greater DC area, including Arlington, Alexandria and parts of Maryland. State bike map. For long-distance travelers, use this official state bicycle map from the Virginia Department of Transportation. You can also receive a paper version via this request form. Bike lanes (either dedicated or shared) are available on Cameron, Prince and Pendleton streets in Old Town as well as Commonwealth Ave., Mt Vernon Ave. and Braddock Rd. in Del Ray. For more details, see the Alexandria Bike Map. Bike racks have been installed along sidewalks near many local businesses and other locations for your convenience, like along King St. in Old Town and Mount Vernon Ave. in Del Ray. Rackspotter can help you find the closest bike rack to your current location or desired destination. At the following locations, bike corrals replace automobile parking spaces to provide additional bicycle parking options. 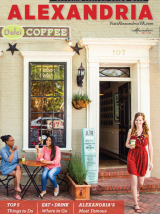 Old Town waterfront on King St.
Laws can vary from state to state, so here&apos;s a look at how we do things in Virginia along with local information and safety tips from the City of Alexandria. Bicyclists must follow all traffic laws that apply to motorists, including traffic signals, signs and lane markings. Bicyclists must ride on the right side of the road, along with the flow of traffic. Always wear a helmet. In Alexandria specifically, all riders 14 or younger are legally required to wear helmets. Bicycles can be brought on the DC Metro except during rush hour periods (7-10 a.m. and 4-7 p.m. weekdays). You also can park your bike at most Metro stations, or attach it to the front of Metrobuses or the free King Street Trolley. Bicycling is permitted on sidewalks except where specifically prohibited, such as on King St. east of West St. (towards the waterfront) and on Union St. between Cameron and Prince. Ride far enough away from the curb to stay clear of opening car doors, potholes, debris and sewer grates and to maintain a straight line. Ride predictably so that others can see you and predict your movements. Use hand signals to indicate turns. Be visible; use lights, and reflectors are required when riding at night. Brightly colored or reflective clothing can help increase visibility. Tap It is a welcome addition for thirsty travelers. With their website or iPhone app, you can find out which businesses or other locations in Alexandria will allow you to fill your own water bottle for free.